The 300 games contests are cumulative contests that run for 300 games. 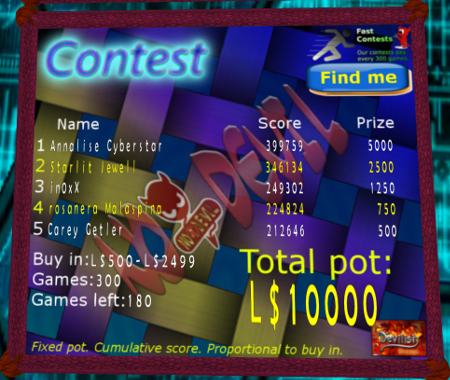 After the 300 games are reached, the contest pays out and starts a new round. For each buy in range there is a different contest, so that people playing e.g. L$5 are not competing to one playing L$5000. The prizes you can win are displayed on the contest. The top 5 players win a prize. The contest pays automatically when the round finishes. You don’t have to do anything. The fun of these contests is that they go fast. You can gain a lot by looking when to play and how much to play.